The world was shocked – and rather amused – when it emerged a little girl had been nibbling away for days on an advent calendar intended for cats. Advent calendar chocolate makes for a tasty ‘breakfast pudding’ during the festive season, making those chilly winter mornings a little bit sweeter. 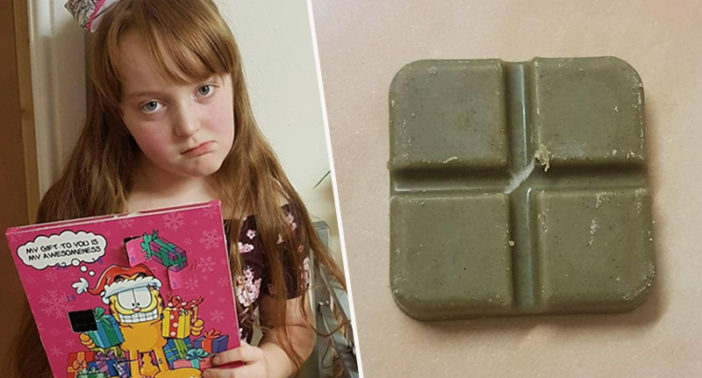 So imagine the surprise of nine-year-old Alissa from Oswestry when the strange smelling, green-tinged chocolate she had been eating turned out to be yoghurt and catnip treats. Of course, we have all picked up the wrong thing during a whirlwind dash to the shops; conditioner instead of shampoo, size twelve shoes instead of size six. And so Alissa’s mum Jessica Evans chose to share the daft yet relatable story on social media, knowing it would make friends chuckle. Little could she have guessed some of the nasty backlash she would go on to receive, with her newfound viral fame opening her up to some all too predictable abuse from cruel trolls. In her original, hilarious post on Facebook, 26-year-old Jessica jokingly referred to herself as ‘the worst mother ever’, explaining how she had initially assumed the unusual green colour was due to an apple flavouring. Not the worst [mother] ever, however, if you payed [sic] more attention to your shopping and less towards looking like a real-life Barbie, your kids might have a fighting chance. Intelligence isn’t big with hair dye types. We haven’t made any money from this story, its intention was a light hearted article to make people laugh in the lead up to Christmas, not to open myself up to abuse (but welcome to the age of the internet). The calendar does state ‘for cats on the front’ but be honest who reads a calendar that was put on the same shelf as the chocolate ones presumably by a customer, I didn’t pick it up down the cat section and think to myself this will do. Plenty of people have rushed to offer their support after Jessica started to receive the completely uncalled for online abuse, while thanking her for giving them a hearty laugh. Ignore the people who can’t see light hearted bants. Jess has three beautiful children, she made a mistake like all mothers do, It’s called life. Jess is a good mum and the kids have a lovely dad too who look after them well, never short of anything so keep your opinions to yourself. Well said. As long as Alissa is feline fine after her shock, all’s well that ends well!